Helping save Las Vegas as the destination capital of the world! LAS VEGAS, NV, February 13, 2019 /24-7PressRelease/ — With a decline in weddings in Las Vegas and a tarnished image in the destination wedding industry, Melissa & Trey Tomsik, a husband and wife team of professional photographers, started Scenic Las Vegas Weddings to shake up the Las Vegas wedding business. Ten years ago this Valentine’s Day, the couple set out on a mission to change the old image the world had of Las Vegas Weddings being “cheesy” or only having a fat, old Elvis perform the ceremony. Melissa and Trey wanted to show the world the breathtaking beauty of the surrounding Las Vegas Valley and the beautiful wedding photography that Las Vegas has to offer. They also wanted to change how the the typical Las Vegas chapel business was run. The couple got rid of hidden charges, limited the number of weddings, and provided truly professional photography, to give each couple a great experience. Melissa and Trey Tomsik vowed to be very transparent about all costs and expectations, unlike the typical Las Vegas wedding chapel. They pride themselves on giving couples the best wedding photography, while making sure all their happy wedding couples have a 5-star experience. 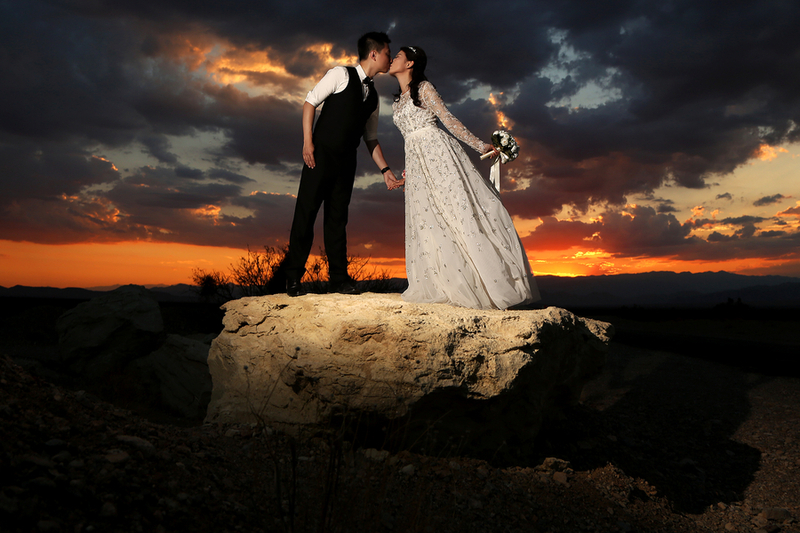 With amazing Scenic Vegas locations like Valley of Fire, Eldorado Canyon Mines, Lake Mead, Pahrump Winery, and Red Rock Canyon, couples can expect one-of-a-kind wedding photography and an experience of a lifetime. ScenicLasVegasWeddings.com provides all-inclusive weddings that include courtesy limousine transportation, minister, photographer, a video of the ceremony, bouquet & boutonnière, and photo rights. Scenic Las Vegas Weddings strives to give all couples a stress-free, wonderful experience. You don’t have to be getting married to use Scenic Las Vegas Weddings. They also offer vow renewals, commitment ceremonies, engagement photography, family photography, and hiking at all their awesome locations. There is something for everyone! Contact Scenic Las Vegas Weddings today for more information about all the spectacular locations around Las Vegas to have an unbelievable experience with stunning photography! Scenic Las Vegas Weddings is a full service destination wedding and photography company in Las Vegas, Nevada.